Techkon USA Announces New G7 Features and Initiatives to Fully Support Its Worldwide Network of Printing Industry Professionals. Techkon USA, the innovation leader in densitometers, spectrophotometers, and software solutions for the global print and packaging communities, announced today three new initiatives to provide support for G7. Techkon’s commitment to innovation and adherence to standards like G7 are apparent in both their product development and their creation and distribution of educational material to benefit printing industry professionals. The first initiative is the release of new firmware for the SpectroDens 4 handheld and scanning Spectro-Densitometer. 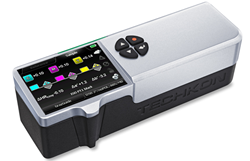 The firmware update, free to current SpectroDens 4 users, truly takes Techkon’s G7 functionality to the next level. With the goal of making G7 even easier to use on the SpectroDens, some of the new features include the option for dynamic calculation of NPD and HR_cmy target CIE a* & b* values. It also displays both reference and measured CIE L*a*b* values for primaries and overprints along with specific density adjustments to minimize delta E’s on the primaries. Additionally, in response to the overwhelming support and adoption of the first Printer’s Guide to G7, Techkon will distribute its updated 2018 Printer’s Guide to G7. The guide, written by Ron Ellis, includes the most up to date information on implementation, calibration, and production checking. The guide will be available via a free download from the Techkon USA website at http://www.techkonusa.com/new-2018-printers-guide-to-g7/. Lastly, in order to best serve our worldwide network of printing industry professionals, Techkon will host a free webinar in conjunction with Ron Ellis on November 30, 2017 at 2:00PM EST. The webinar will cover most topics in the 2018 Printer’s Guide to G7 in addition to providing a Q&A session. TECHKON is the innovation leader in densitometers, spectrophotometers and color software solutions for the global print community. With a track record of 30 + years of continued technological excellence, TECHKON products are chosen for their high degree of measurement accuracy, repeatability, reliability and ease of operation in all sectors of the printing industry. TECHKON’s innovative color measurement solutions have led to highly successful implementations by leading OEM press manufacturers and large commercial printers, yielding dramatic gains in quality, productivity and cost savings.